You can work with Camera Raw images in Photoshop Elements if your digital camera is capable of capturing images in the Camera Raw format. If you don’t currently have a camera capable of capturing Camera Raw images, you might want to look over this information to understand how this file format can benefit you. Camera Raw images enable you to post-process your pictures. When you take a digital picture in Camera Raw format, the camera’s sensor records as much information as it can. 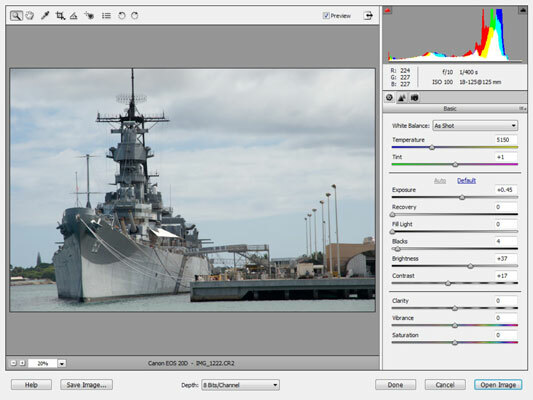 When you open a Camera Raw file in Elements, you decide what part of that data is opened as a new image. If you acquire images that are saved in JPEG format, you need to do a lot of color correction after the image opens in Elements. If you shoot the image in Camera Raw format, you just process the image with a warmer temperature (consistent with conditions when the shot was taken), and your color correction in Elements is a fraction of what it is to fix a JPEG image. Each camera developer uses a different flavor of Camera Raw, and some developers use different Raw formats between different models in their product line. Although Adobe tries to keep up with all the various Raw formats, you may find a camera using a format not supported by the Raw plug-in. Be sure to check updates online for Photoshop Elements. Open the image by pressing Ctrl+O (cmd+O on the Mac) and select the image in the Open dialog box. If you want to select several images in a row, click the first image, hold down the Shift key, and then click the last image. If you want to select several nonadjacent images, Ctrl-click each image (cmd-click on the Mac). If you’re selecting multiple images, only one image appears in the Camera Raw dialog box. When you click Open Image, the next image opens in the Camera Raw dialog box. Open a Camera Raw image, and the image opens in the Camera Raw plug-in window. You can use a vast number of options to post-process your image before you drop it into Elements. This window is like a digital darkroom, where you can process the film and see what you’re doing to the image before you accept the changes. If you have your monitor properly calibrated, all the adjustments you make for Camera Raw format are dynamically updated in the image preview. Click the Help button in the lower left corner of the window to open a Help document that will assist you in understanding more about Camera Raw and the options available in this window.